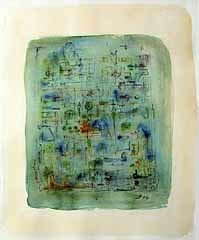 Dr. Jonathan Palmer a Boston psychoanalyst and artist, works with watercolor, primarily, using multiple, layered washes of colors, alternating with mark making that suggests ancient script or pictographs of early civilizations, strange languages that capture unintended images and suggest feelings of which we are unaware. 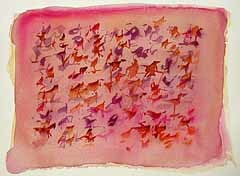 Colors glow and blend subtly, becoming a backdrop or a page of torn parchment with mystic utterances transformed as visual symbols, dancing a language of symbolic shapes and forms on the front plane of the paper. 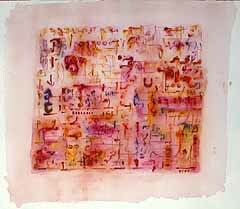 Palmer uses color, line, shape and form to communicate that which is not yet speakable or known. 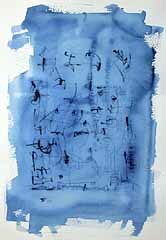 Words, as transformed to visual symbols, manifest in many of his paintings often as calligraphic threads of images. For Palmer, allowing for the accidental slip in mark-making or color is a fundamental precursor to what is not yet conscious. The finished painting is intended to hold an image which is felt more than known by the viewer, with the intent that each observer can find his/her own symbolic meaning within the space of the painting. Jonathan Palmer was born in South Africa. He began his formal training in he drawing and painting with Bill Ainsley (Johannesburg) and Paul Stopforth (University of the Witwaterstrand in Johannesburg). Later, in Boston, Palmer again studied with Stopforth, who had also immigrated to Boston, and with Ron Rizzi. Palmer has pursued his passion for painting even as he became a psychoanalyst. He received his college and medical school education in Johannesburg, South Africa, and his psychiatric training at Harvard Medical School and at The Boston Psychoanalytic Institute and Society. He is currently a Training and Supervising Psychoanalyst at the Boston Psychoanalytic Institute and Society, a Clinical Instructor in Psychiatry at Harvard Medical School, and in private psychoanalytic practice.